Based on the recent excavation at the cave of Petralona it is calculated that the history of Chalkidiki goes 700.000 years back to time. According to paleontologists that studied the findings of the cave, the first controlled fire lit in Chalkidiki about 700.000 years ago. The scalp that was discovered in the cave is estimated to be 250.000 years old and gave to science a new type of human. A lot of prehistoric settlements have been discovered along the coastline. These settlements depict that about 4000 B.C. Chalkidiki was already a rich, densely populated area where art flourished and works of art graced everyday life of people. 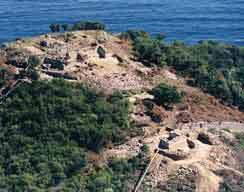 Recorded data refer to the colony of Chalkidiki at the times of the Trojan War. However, its systematic colony of the residents of South Greece seems to begin from the 8th B.C. century. Colonists came mostly from Chalkida and Eretria. The first historical record that we have for Chalkidiki comes from Irodotos. In his scripts for the Persian wars, the father of history repeatedly mentions Chalkidiki and gives historical and topographical details. He describes the destruction of the fleet of Mardonios from a great storm in Atho, and the digging of a channel at the isthmus of the peninsula from Xerxis. Irodotos refers to all these inshore towns of Chalkidiki, where Xerxis imposed recruitment of men and gives important information about the Persian siege of Poteidea and the enslavement of the residents of Olinthos from the Persian leader Artavazo. After the Persian wars (in the middle of 5th B.C century), most of the towns of Chalkidiki became members of the Athens' alliance. During the Peloponisian war (one of the causes for its outbreak was Poteidea), Chalkidiki was for many years a field of war between the Athenians and the Lakeidemonians. As a result, many of its towns were destroyed and its residents realized that in order to survive they would have to unite. In 168 B.C. Chalkidiki, just like the rest of Macedonia, was conquered by the Romans. At the years that followed, Roman and Italian traders and technicians settled in its towns. In the 6th A.D. century, Chalkidiki was rummaged again, this time from the Ounous. Between the 9th and 15th century, Chalkidiki was basically a farming and cattle-breeding area. From the monuments of the medieval Chalkidiki only a few ruins have remained and the most remarkable of them are castles, towers and monasteries. In the beginning of the 16th century, a mint worked for a small period in Sidirokafsia(today's Stagira). In 1821, Chalkidiki played an important role in Greek revolution. The battle began in 17th of May from Poligiros and quickly expanded in the entire peninsula. Emanouil Papas, trader from Serres and member of the "Friendly Association", was the leader of the revolution in north Greece. Using the mount Atho as a fort, he organized groups of battle, which were successful initially, but as time passed they were defeated by the Turks and withdrew in the peninsula of Kassandra. In the beginning of the 21st century, it was one of the resistance forts of the Macedonian fight , and was also used as a warrior sanctuary. Weapons and ammunition were off-loaded there and were passed on to the rebels. Many residents of Chalkidiki took part in the resistant forces of Pavlos Melas and the other Macedon leaders. So, in October 1912, 20 days before the release of Chalkidiki, Chalkidiki regained its freedom.After 1922, the history of Chalkidiki came into a new phase. Thousands of refugees from Mikra Asia, Thraki and Bulgaria settled on its grounds. Today, 75 years after its third settlement it has a unique financial development with the prospective to become one of the most important touristic resorts of Europe.